A friend recently gave me this water fountain to try out. I love water fountains for my cats and I like unusual items as well. 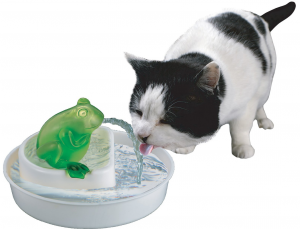 Well the Cats Rule Frog Watering Hole is definitely a quirky item. So I had to try it out (or more importantly Dyson had to try it out). Did I mention that this fountain was quirky? Well if you like frogs you will like this. The fountain itself is a green frog sitting inside a white bowl on top of a pool of water. The water itself flows out of the frog’s mouth into the bottom ‘pond’. If your cats like running water and drinking from a tap then they may like this. The pump fits under the frog bowl together with the active carbon filter. Well set up is a cinch. The watering hole comes completely assembled. However, take off the frog and its bowl first to check out the filter. This will be in plastic wrapping so remove this before you start and run the filter under a tap. This activates the carbon filter and removes any small particles. Fit the filter back in the slots, place the bowl and frog back on top of this. Then fill with water – always keep the water level between the max and min markers. Once the pond is full of water, plug the unit into a power socket. You should now see water start to spout from the frog’s mouth. If you find that the water is moving too fast then the flow can be adjusted. Just switch off the power remove the top frog and pond again to get to the pump. The pump has three flow settings on it. Try different flow rates until you get the one you want. Basically this does what it says on the box. Once it’s filled with water and plugged into the power source, water immediately flows. Your cat can now drink from this whenever. As the water flows in a spout from the frog’s mouth this can also be used by small to a medium sized dog. My cat, Dyson, loves moving water and though she prefers a higher pond area she does often drink from the spout. The pump is pretty quiet, though if you let the water level get too low then it gets noisy. Cleaning water fountains I think is one of the most important things to know. Whilst we all love the health benefits for our feline friends we also want to make sure that the product is hygienic. Therefore, we often want a fountain that is easy to clean and to maintain. You do need to regularly clean the filter under running water. If the filter gets gunked up with dirt and hair then it does stop the unit running or the unit will run noisily. Filters need to be changed every 4 to 6 weeks on average. The pond is made of polypropylene and can be scrubbed under a tap. The frog itself is made from a food-safe plastic resin. The outside of this should be cleaned and if any water gets inside the frog then shake it out. I also advise to give the pump a clean about once a month – this stops the build up of scale and dirt. Cleaning the pump often means a longer pump life and it stops it from getting noisy. One of the best items for cleaning a pump is an old toothbrush. The other part of this that needs regular cleaning is the water spout that comes out of the frogs mouth. This is slightly more difficult to clean. However, if you do not clean this part it can get mouldy. I found that a thin bottle brush is probably the best item for this job and can be fitted inside the tube. Overall this is a fun and quirky water fountain. It looks cute and does a good job of providing fresh and clean water all day long. Cat wise, well it does what it says on the tin and cats will love it. However I found that keeping the unit clean a little onerous – especially the water spout. This was an area that was difficult to get to and the place where mould could grow. I also found that even though the frog is a sealed unit that sometimes water would get inside it. This then stagnates a bit if you don’t get the water back out. (and also you could get soap products in it when cleaning). Whilst this water does not get back into the rest of the unit it could harbor bacteria. If this is your first time with a water fountain then the Cats Rule Frog Watering Hole, White and Green is a good starter. It’s a fun addition and will also have guests asking what it is. It is a cheaper water fountain and running costs are pretty cheap, together with replacement filters. Overall I love the design – frogs are cool. It really does look good. It is just let down by cleaning being tricky and the overall quality. If you want to try this out then click here for a really good price. This is a really cool idea. My cat absolutely loves to drink from the tap. Sometimes it can be very annoying when your brushing your teeth etc and have the cat up there. Maybe a water fountain can make him just drink there instead. Do you have any experience with cats drinking from the tap? Do they usually stop after you give them a watering hole like this? I will have to try it out that’s for sure. Hi, Evie. What a cute gadget! I enjoyed reading your article because you’ve made it a point to talk about Hygeine!! Just as we don’t want our children ill our pets shouldnt become ill from their eating/drinking places. I never understood owners who aren’t clean with regard to their animals, it could mean their health. I may just get one for all my little furry friends that drop by now and again. ? That is so cool! I love water fountains and just to have that without the cat interaction would be a pleasure. However I could see how the cat interacting with it would be entertaining too. Most things that involve movement and cats tend to be amusing, at least to me that is. 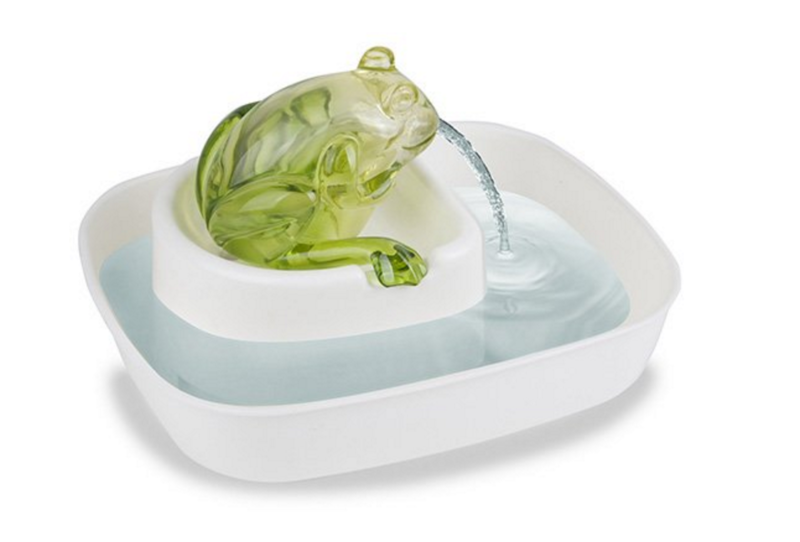 Thank you for sharing this cool yet “quirky” frog water fountain. And especially thanks for the cleaning tips. I would suspect that if a cat were to be drinking from it that eventually there would be some hair and dirt build-up. But from your description it sounds as though clean up would be quite easy. Thanks again! This is such a cute water fountain. I wonder if skittish cats would be nervous about the Frog? Also, I have never owned a watering fountain. Is this something that runs 24/7? Or do you turn it off during night hours? Thank you for your great post. This is very cool. I don’t have cats at the moment, but I do have two toy poodles. I’m wondering if this could work for little doggies as well? You did such a great job with your review and I love your website. Bookmarking for sure! Thanks for the great info. Hi Thanks for stopping by – yes this does work for small dogs, though you might want a slightly higher capacity water fountain such as the Cat Mate Water Fountain which we review here. This is such a cute little fountain. Does it also work for small dogs? 1. Is it easy to topple? 2. How easy does it move around, when it is full (or not so full), if standing on ceramic tiles? My cat usually drags its bowls all around the floor. 1. Water fountains do not topple as they are pretty sturdy – even if the cat steps into the bowl they will not topple. They also hold a lot more water than static bowls so are heavier. I love this one, it looks great. And even if you do not own a cat you always can think about having water lilies or any other plant that needs a lot of water. What I do not read is the amount of noise it makes, I can understand the sound of the water but you plug it into a power source this means there must be a motor pushing the water. How much noise does this motor make?